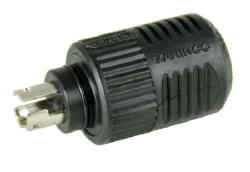 The ConnectPro trolling motor plug and receptacle is a revolutionary new concept in trolling motor connections. The ConnectPro has superior electric current carrying capacity that eliminates problems that rob motors of power and reduce battery life. The ConnectPro system features locking plug and receptacle and spring clamping connection which provides a secure, superior electrical connection for trolling motors.